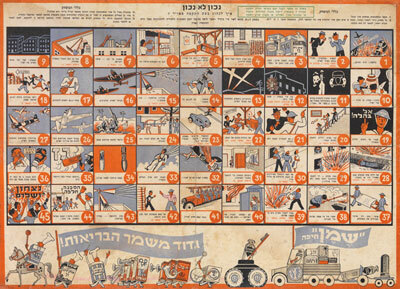 Among the dynamic programs of the Israel Museum's Ruth Youth Wing for Art Education are annual exhibitions for the entire family, aimed at stimulating a new understanding of and experience with art. This presentation of Life: A User's Manual raises questions about the rules and guidelines (such as those in the interactive exhibition itself), that greet us at every turn in our daily lives. It resonates with the encyclopedic nature of our Museum, drawing on holdings as diverse as: a Dead Sea Scroll with regulations for apocalyptic warfare; a book detailing Jewish customs in Europe; the precise pattern for a carpet to be made at the Bezalel School of Arts and Crafts in Jerusalem; and exquisite sketches from India, complete with directions as to how they should be colored. These are only a few of the many examples of world visual culture that testify to the universal need to make and follow instructions. The exhibition focuses on the complex response of today's artists to this subject, presenting works from our own holdings in contemporary art, enriched by loans from individuals and institutions and by specially commissioned works of art. We are grateful to all of the artists and lenders who participated in the exhibition. Our thanks also go to the Marianna Griessmann Fund, the Morris Rodman Fund, the J. Weinstein Foundation, and the donors to the Museum's 2011 Exhibition Fund for sponsoring the exhibition and its accompanying publication. It was Dr. Tali Gavish, Head of the Youth Wing for Art Education, who initiated this project in which the Ruth Youth Wing "hosts" an exhibition curated from within the Edmond and Lily Safra Fine Arts Wing, meeting with a supportive response from Suzanne Landau, Yulla and Jacques Lipchitz Chief Curator of the Fine Arts. Finally, we salute the exhibition's curator Aya Miron, Associate Curator in the David Orgler Department of Israeli Art, who, with the assistance of Associate Curator Smadar Gafni from the Youth Wing and many members of the Museum staff - and in fruitful collaboration with exhibition designer Ido Bruno and publication designer Michal Sahar - has advanced our tradition of proposing original ways to interact with art. התערוכה "החיים: הוראות שימוש" מעלה שאלות הנוגעות לחוקים ולהנחיות (כגון אלה הפזורים בתערוכה) המקדמים אותנו בכל היבט של חיי היומיום. הכוּליוּת הזאת מתאימה ככפפה ליד לאוספים האנציקלופדיים של המוזיאון, שכן התערוכה המתמקדת בתגובה המורכבת של אמנים לנושא מציגה בעיקר אמנות עכשווית, אך יש בה נציגות גם למגוון אוספים במוזיאון. כמו-כן הושאלו יצירות מאוספים פרטיים וממוזיאונים ואף נוצרו עבודות במיוחד לתערוכה. יחד עם התכניות לכל המשפחה המוצעות באגף הנוער והחינוך לאמנות, מזומנות לקהל התנסות איטראקטיווית וחשיבה רעננה על אמנות. אנו מודים לכל האמנים ולמשאילים לתערוכה. תודתנו שלוחה גם לקרן מריאנה גריסמן, לקרן מוריס רודמן, לקרן ויינשטיין ולתורמי קרן התערוכות לשנת 2011 על מימון התערוכה והקטלוג הנלווה לה. תודה לד"ר טלי גביש, ראש אגף הנוער והחינוך לאמנות ע"ש רות, על שהזמינה ביזמתה אוצרת מאגף אדמונד ולילי ספרא לאמנויות לאצור תערוכה באגף הנוער. תודה לסוזן לנדאו, אוצרת ראשית לאמנויות ע"ש יולה וז'אק ליפשיץ, על תמיכתה לאורך כל הדרך. לסיום, אנו מברכים את אוצרת התערוכה איה מירון, אוצרת-משנה במחלקה לאמנות ישראלית ע"ש דוד אורגלר; בעזרת סמדר גפני, אוצרת-משנה לתערוכות מאגף הנוער, ועמיתים רבים מצוות המוזיאון, ובסיועם המפרה של מעצב התערוכה עידו ברונו ומעצבת הקטלוג מיכל סהר, המשיכה איה את מסורתנו רבת-השנים להציע דרכים מקוריות להתבונן באמנות ולהגיב אליה. This exhibition brings together artworks that deal with different aspects of instructions. It is a dialogue between the artists and voices of authority. At times the artists obey instructions; at times they oppose them or replace them with their own directives. The course they take toward the orderly and rational form of instructions is intentionally subverted, as they call attention to the absurdities and internal contradictions of reality. Some artists adopt the visual language of instructions; others use their piecemeal, step-by-step structure in order to focus on the stages of the creative process. Examining our day-to-day activity as a response to instructions, the exhibition raises questions: When do we follow instructions, when do we disobey them, and when do we treat them with indifference? Whom do we obey, and whose instructions do we ignore? What is the "user's manual" that dictates our lives? In what kind of language do instructions address us? And are there differences between various kinds of address - suggestions, guidelines, requests, demands, or commands? We are surrounded by instructions, certainly in public places, where rules, signposts and laws oblige us to behave in certain ways. In our private lives as well, we choose to be instructed. Some instructions enable us to perform a task that otherwise would seem too complicated, whereas others immediately disclose that it is beyond us. Instructions can be given verbally or in writing, in a demonstration film or even without words, using body language, drawings or symbols. They are always transmitted by one person to another, usually anonymously. Consequently, instructions are impersonal, leaving us with a sense that they come from an authority - someone who "knows what he's talking about." Instructions need to be clear and concise. They are generally phrased in imperative language, a one-way channel of communication bespeaking asymmetrical power relations. The place and time in which a task is to be performed are usually not indicated (though preparation instructions typically indicate the amount of time needed), nor is the identity of the performer given. The emphasis is on the "how?". Often they appear to teach or alter us, because they draw attention to behavior. The truth, however, is quite different: The person following step-by-step instructions must suppress the urge to seek meaning. The one-way nature of instructions precludes the possibility of requesting clarifications or expressing doubt. A definitive example of instructions in modern everyday life is to be found in the mass consumer culture of do-it-yourself (DIY) products. Its roots lie in pre-Industrial Revolution Europe, when the construction of models from various raw materials was a common pastime of the upper classes, a testament to their ample leisure time, and hence a status symbol. With the Industrial Revolution, leisure time became a feature of middle-class life as well. Anxious to imitate the aristocracy and demonstrate their fine technical skills, members of this class also adopted the hobby of model construction. 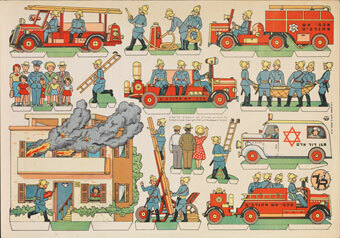 Toward the middle of the twentieth century, with capitalism in the ascendancy in the West, assembly kits became a ubiquitous feature of the consumer culture, replacing the individually handcrafted model or project with mass-produced, ready-to-assemble kits, accompanied by clear manufacturer's instructions that left little room for individual creativity. Consumers, for their part, bought do-it-yourself products in an attempt to recapture the experience of handicraft and individual expression. The command ("do it") contradicts the second part of the phrase ("yourself"), or at least restricts the freedom to work individually, creatively and independently. In a secular age, with its alienation from religious imperatives, these kinds of instructions may answer a genuine human need for guidance 'from above.' Through the perfect products promised by the assembly instructions, consumers hope to realize the implied promise of a happy life as well. "How-to" instructions have a strong ceremonial dimension, with elements reminiscent of religious observance, such as a sequence of prescribed actions couched in special language. The authority of such instructions, like that of religious laws and rituals, lies in the act of obeying them, and in their immutability and preservation of an existing order. 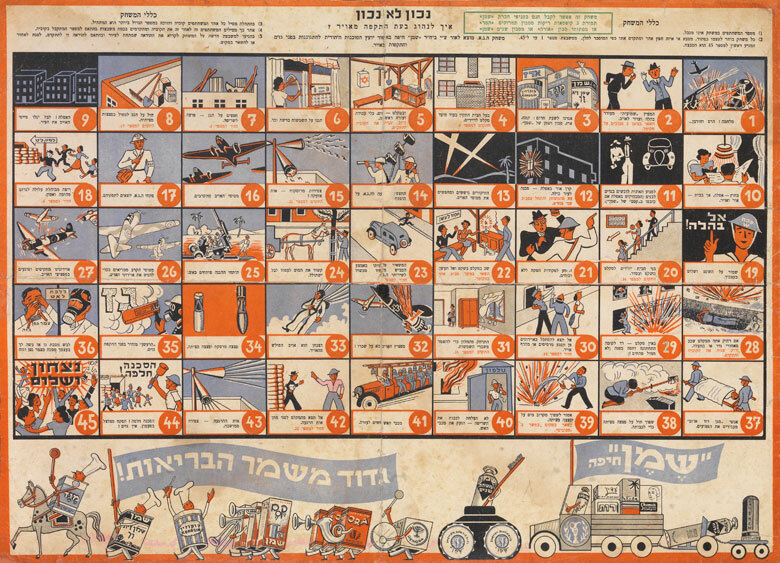 Thanks to the rich diversity of the Israel Museum collections, this show exhibits many items from various eras and cultures alongside contemporary artworks. A gentleman's manual from seventeenth-century England lists the skills the landed gentry are expected to acquire. An eighteenth-century engraving shows instructions for putting on tefillin (phylacteries, used in the Jewish prayer ritual). The items and their application are illustrated on two disembodied arms, recalling the layout of machine parts or furniture sections in self-assembly manuals. From Vienna of the mid-nineteenth century comes a page of instructions for Jewish ritual slaughterers, who were responsible for providing kosher meat. The animal's internal organs are depicted in isolation from each other, to facilitate their identification. Two pairs of exhibits constitute visual instructions that focus on the production process. The first is a couple of magnificent carpet patterns designed in Jerusalem a century ago in what was then called the Bezalel School of Arts and Crafts. Since the patterns were symmetrical, the designers drew just half of the carpet in one instance, and only a quarter in the other. The second pair is of two drawings from seventeenth- and eighteenth-century India, in which the artists put a dab of color in each sector, as color instructions for their assistants to complete. The oldest item represented in the exhibition is one of the Dead Sea Scrolls, known as the "War Scroll." It describes a conflict destined to take place at the end of days between the "Sons of Light" and the "Sons of Darkness." The section on display contains instructions for battle, including the organization and weaponry of the military units, and their deployment in battle formation headed by priests blowing trumpets. Since instructions are, by their nature, based on experience, they impart a reality and immediacy even to such a far-off prophetic event. A description of the relationship between the giver of instructions and those who follow them can be found in the words of Georges Perec, describing the making of jigsaw puzzles, in his introduction to Life A User's Manual*, the book from which this exhibition takes its name. "Despite appearances, puzzling is not a solitary game: every move the puzzler makes, the puzzle-maker has made before; every piece the puzzler picks up, and picks up again, and studies and strokes, every combination he tries, and tries a second time, every blunder and every insight, each hope and each discouragement have all been designed, calculated, and decided by the other." Perec's words reflect the complexity of this relationship. They delineate the connection between the two through a powerful and sensual shared experience, but an experience that the one has in fact staged for the other. The artists whose works appear in the exhibition sought to redefine the relationship between instructions and the actual actions they generate. They highlighted the inherent gaps between instructions and their fulfillment, sometimes humorously, sometimes with irony. Their focus on processes that involve a sequence of actions, and not just on the final product, raises the question of when, exactly, a work of art is complete. Like a musical composition in which a series of instructions is interpreted differently by different performers, is the artwork interpreted anew by everyone that views it? * George Perec, Life a User's Manual, trans. David Bellos (London: Vintage, 2003). התערוכה מקבצת עבודות של אמנים העוסקים בהיבטים שונים של מילוי הוראות. בדרך לאותו מערך הגיוני וסדור הם משבשים משהו ומכוונים את המבט אל הגיחוך, אל האבסורד ואל הסתירות הפנימיות שבמציאות. ביצירתם יש המשוחחים עם בעלי סמכות, לעתים פועלים לפי הוראותיהם ולעתים מתנגדים להן, ויש הממירים את קולו של נותן ההוראות בקולם ובתכנים משלהם. אחדים מאמצים את השפה החזותית המאפיינת הוראות ואחרים מנצלים את הוראות ההכנה רצופות השלבים להתמקדות בתהליך היצירה, בשלבי הפעולה שלה ובזמן התהוותה. התערוכה מציעה להתבונן בפעולות היומיום כתגובה להוראות ומעלה שאלות -מתי אנו פועלים לפיהן ומתי אנו מתנגדים או אדישים להן? למי מצייתים ומהוראתו של מי מתעלמים? מהו "ספר ההוראות" המכתיב את חיינו? באיזו שפה נעשית הפנייה בהוראה? והאם יש הבדלים בין סוגים שונים של פניות -בין הצעה, הנחיה, בקשה, דרישה או ציווי? הוראות מקיפות אותנו מכל עבר ומפעילות אותנו במקומות ציבוריים, שם הן מחייבות באמצעות כללי התנהגות, תמרורים וחוקים, אך גם במרחב הפרטי, לשם אנו מכניסים אותן מבחירה. יש שהן מאפשרות לבצע משימה שבלעדיהן היא נראית מסובכת, ויש שדי בהצצה בהן לדעת שהמשימה היא מעבר לגבולות היכולת שלנו. ההוראה יכולה להינתן בעל-פה או בכתב, בסרט הדגמה ואפילו בלי מילים, בשפת גוף, בציור או בסמלים; היא תמיד מועברת מאדם אחד לאחר, על-פי רוב לא מוכר, ולכן אינה אישית באופייה ומעוררת תחושה שנותן ההוראה הוא דמות סמכותית, מישהו ש"יודע מה הוא אומר". על ההוראה להיות תמציתית וברורה, ולרוב היא מנוסחת בלשון ציווי, ערוץ תקשורת חד-סטרי במהותו המדגיש את יחסי הכוחות הלא-סימטריים. בדרך-כלל בהוראות לא מצוין מקום או זמן הפעולה (בהוראות הכנה מצוין על-פי-רוב משך הפעולה) וגם עושה הפעולה נעדר מהן. הדגש בהן הוא על ה"איך". לפעמים יש בהן מראית-עין של לימוד או שינוי כי הן מפנות תשומת-לב אל ההתנהגות, אבל האמת הפוכה כמעט. כשההוראה מכוונת לרצף של פעולות, המבצע נדרש להשעות את הדחף להבין, למצוא משמעות או הסבר, ומובן שהאופי החד-סטרי מונע ממנו לקבל הבהרות או להטיל ספק. אחד הביטויים המובהקים להוראות בחיי היומיום המודרניים הוא תרבות הצריכה ההמונית של מוצרי "עשה זאת בעצמך". שורשיה בתקופה שקדמה למהפכה התעשייתית, אז היתה הרכבת דגמים ממגוון חומרי גלם אחד מסממני מעמדם של בני אצולה באירופה, שהיו משופעים בשעות פנאי. המהפכה שהחלה במחצית השנייה של המאה ה- 18 צירפה למעגל הפנאי גם את בני המעמד הבינוני, וברצותם להידמות לבני האצולה ולהתנאות ביכולתם הטכנית המעולה, פיתחו גם הם את תחביב הרכבת הדגמים להנאתם. לקראת אמצע המאה ה- 20 , עם התבססות הכלכלה הקפיטליסטית במערב, הפכה הרכבת ערכות ליסוד בתרבות הצריכה ושינתה את פניה ממלאכת-יד בעלת אופי אישי באמצעים קרובים וזמינים, לייצור המוני של ערכות מוכנות מלוות בהוראות. יצרנים החלו לספק הוראות הרכבה ברורות שלא השאירו מקום רב ליצירתיות, והצרכנים מצדם רכשו את מוצרי "עשה זאת בעצמך" כדי לשוב ולהתקרב לעשייה חומרית ולביטוי אישי. הפנייה בלשון ציווי, "עשה זאת", סותרת את חלקו השני של המושג - "בעצמך", או לפחות מבצרת את החופש לפעול באופן אישי, יצירתי ועצמאי. בעידן של חילון והתרחקות מציוויים דתיים הוראות מסוג זה אולי עונות על צורך אישי אמיתי בהנחיה "מלמעלה". באמצעות התוצרים המושלמים שהוראות ההכנה מבטיחות, הצרכנים מקווים לממש גם את ההבטחה המקופלת בהם לחיים מאושרים. המגוון באוספי מוזיאון ישראל אִפשר להעמיד לצד אמנות מודרנית ועכשווית גם חפצים מתקופות ומתרבויות אחרות, ובהם תחריט של אלברכט דירר מן המאה ה- 16 המתאר את אדם וחוה בגן-העדן, סיפור המעמיד במרכזו את תגובת בני-האדם להוראת האל; ספר הוראות לג'נטלמן מהמאה ה- 17 באנגליה המרכז מיומנויות שאצילים בעלי אחוזות נדרשו להיות בקיאים בהם; תחריט הוראות להנחת תפילין מהמאה ה- 18 שמתוארים בו כל רכיבי הטקס על-ידי הצגת שתי זרועות מנותקות מגוף. הנחת התפילין עליהן מציגה אותן כאילו היו עוד חפץ ומזכירה פרישה של חלקי מכונה או רהיטים במדריכים להרכבה עצמית הנדמים כמו מרחפים על פני הנייר; גם בדף ההוראות לשחיטה כשרה מווינה מאמצע המאה ה- 19 מתוארים איבריה הפנימיים של החיה מנותקים זה מזה כדי לאפשר לזהותם בנקל. בהוראות מצוירות בשני צמדים של חפצים המוצגים בתערוכה מודגש תהליך ההכנה -בשני מתווים מרהיבים לשטיחים שעוצבו ב"בצלאל" בירושלים בראשית המאה שעברה הסתפקו בתיאור מחצית ואפילו רבע השטיח, היות שדגם השטיחים סימטרי; ובשני רישומים הודיים מהמאות ה- 17 וה- 18 הכתיבו הציירים לאמנים שעבדו אתם את הגוונים לצביעת הרישום על-ידי סימון כל אחד מהמקטעים בכתם צבע קטן. החפץ הקדום ביותר המיוצג בתערוכה הוא מגילה ממגילות ים המלח המכונה "סרך המלחמה". מתוארת בה המערכה שתתחולל באחרית-הימים בין שני מחנות: "בני אור" ו"בני חושך". הקטע המוצג מפרט את הוראות סידור הלוחמים על סוגיהם ונשקיהם לקראת היציאה לקרב, ובראשם הכוהנים התוקעים בחצוצרות. מכיוון שהוראות מטבען מבוססות על ניסיון, הרי שבמקרה זה הן מקנות אופי ממשי-יישומי גם לאירוע נבואי. את היחסים בין נותן ההוראות לבין מי שפועל לפיהן אפשר לתאר באופן שז'ורז' פרק תיאר את בניית התצרף (פאזל) בהקדמה לספרו החיים הוראות שימוש,* שהשאיל לתערוכה את שמה -"על אף מראית העין, אין זה משחק לבודדים: כל תנועה ששחקן הפאזל עושה -יוצר הפאזל עשה כבר לפניו; כל חלק שהוא נוטל בידו ושב ונוטל, שהוא בוחן, שהוא מלטף, כל צירוף שהוא מנסה ומנסה שוב, כל גישוש, כל אינטואיציה, כל תקווה, כל ייאוש -הוכרעו, חושבו ונשקלו על ידי האחר". דבריו של פרק נותנים ביטוי למורכבות היחסים: הם מתארים קשר בין השניים באמצעות חוויה חושנית וחזקה המשותפת לשניהם, ובו בזמן כזו שאחד מהם ביים אותה במלואה בעבור האחר. אמני התערוכה ביקשו להגדיר מחדש את היחסים שבין הוראות לבין הפעולות הנגזרות מהן במציאות. את הפערים המובנים בין ההוראות למימושן הם הדגישו לעתים באמצעות הומור, לעתים באירוניה. ההתמקדות שלהם ברצף של פעולות, ולא רק בתוצר הסופי, מעלה את השאלה באיזה רגע נשלמת יצירת האמנות, והאם כמו יצירה מוזיקלית -מעין סדרת הוראות שכתב מלחין ומבצעים שונים מפרשים בדרכם -היא מקבלת ביטוי חדש מכל אחד מהצופים בה. * ז'ורז' פרק, החיים הוראות שימוש, תרגום: עידו בסוק, הוצאת בבל, תל-אביב, 2005 .